Jayalalithaa, a spinster, breathed her last at the Apollo Hospitals just before midnight, over 24 hours after she suffered a cardiac arrest that derailed the halting progress she had been making on the health front. "It is with indescribable grief, we announce the sad demise of our esteemed Honourable Chief Minister of Tamil Nadu, Puratchi Thalaivi Amma at 11.30 p.m.," the hospital said in a statement. As Jayalalithaa's death became known, a loud wail rent the air outside the Apollo hospital where thousands had gathered since her cardiac arrest on Sunday evening, hoping against hope that she would survive.Her body was taken to her residence at Poes Garden, where hundreds of AIADMK cadre were present. Police used batons to keep inconsolable mourners away who tried to break the security barricades outside their leader's house. The last rites will be held at the Marina Beach later on Tuesday.As national leaders expressed grief, the Tamil Nadu government declared a seven-day mourning. Schools and colleges in the sprawling state will be closed for three days.In no time, the AIADMK legislators elected Finance Minister and long-time Jayalalithaa loyalist O. Panneerselvam to succeed the departed leader. Shortly after 1 a.m. on Tuesday, Panneerselvam took the oath of office and secrecy. Thirty-one ministers were also sworn-in with him.A veteran actor, the self-made Jayalalithaa, who was five times Chief Minister of Tamil Nadu, was admitted to the Apollo hospital on September 22 with fever and dehydration, just four months after she led the AIADMK to triumphantly retain power in assembly elections. "She was progressive in her thought and pro-active in pursuing the issues that were close to her heart, such as the empowerment of women and welfare of children. 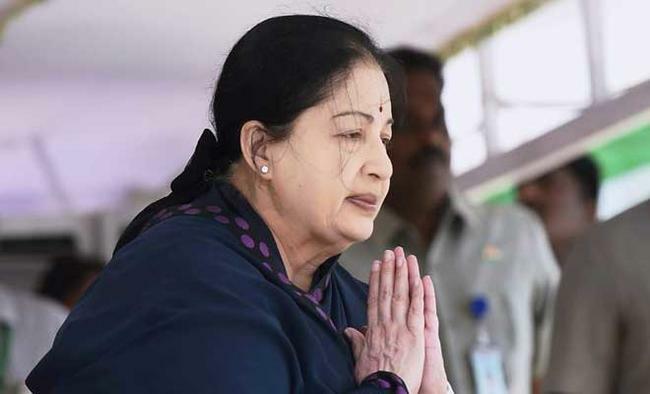 "Her life was dedicated to the socio-economic transformation of Tamil Nadu and its people. Her contribution to the progress and development of Tamil Nadu will be long remembered." Modi, who enjoyed a personal rapport with Jayalalithaa, said her demise had left a huge void in Indian politics.Defining her as a mass leader, Modi said: "Jayalalithaaji's connect with citizens, concern for welfare of the poor, the women and marginalised will always be a source of inspiration." Congress President Sonia Gandhi, who too had counted the AIADMK leader as an ally for years, said Jayalalithaa lived the entire life with the same "indomitable courage with which she battled her last illness".West Bengal Chief Minister Mamata Banerjee called her "popular, strong, bold, efficient, people-friendly, charismatic leader". Bihar Chief Minister Nitish Kumar described her death as "very saddening". He announced a day's mourning in his state.Delhi Chief Minister Arvind Kejriwal tweeted: "Very sad to hear the demise of Amma. A very very popular leader. Aam Aadmi's leader. May her soul rest in peace."